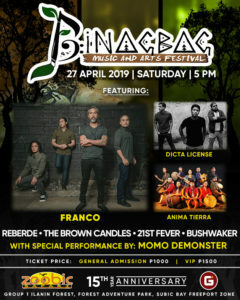 In celebration of its 15th year anniversary, Zoobic Safari introduces the first Binagbag Music and Arts Festival with perfomances by Franco, Dicta License, Anima Tierra, Reberde, The Brown Candles, 21ST Fever, Brushwaker, and Momo Demonster. This will take place on April 27, 2019 in Zoobic Safari, Group 1 Ilanin Forest, Forest Adventure Park, Subic Bay Freeport Zone. re and culture. It supports the conservation of wildlife and defend the rights of the forest. The event features local talented bands with multiple genres and music acts performing rock, reggae, grunge, alternative metal, world music and so much more. The event is also for the benefit of the Aeta community in Subic, Zambales. Aside from promoting their advocacy which is called the 4 E’s (Education, Environmental Conservation, Exhibit and Entertainment) the company believes that it is part of their corporate social responsibility to give back to our Aeta brothers and sisters. 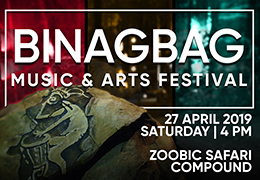 Get exciting discounts and freebies by liking our official Facebook page: Binagbag Music and Arts Festival. For inquiries you may Call: (047) 252-227. Email: betchay_zoobicsafari@yahoo.com or ron_zoobicsafari@yahoo.com. Visit our website at www.zoomanity.com.ph.